As the holiday season approaches and you are faced with Nana’s pies, festive beverages, the stress of holiday travel, and finishing the gift buying, all while trying to stay on track with your healthy living goals. 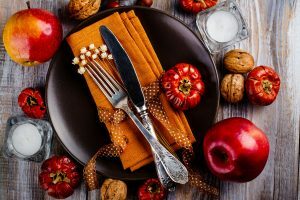 Dietitian and nutritionist Avril Rowerdink,RDN,LDN from Anne Till Consulting recommends a strategy with a different approach to help you manage the holiday season. Rather than counting calories and mentally battling against those seemingly irresistible treats, try these basic principles instead. Our environment influences our food choices, and during the holidays our typical environment shifts to one that can promote atypical eating behaviors. There tend to be more “treats” and an increased variety of food available, more opportunities for social eating, and generally we spend more time around food. A study showed that people eat up to 75% more when eating in a large group versus eating alone! Appetite regulation is key when it comes to making healthy choices. It is really time to get rid of the Halloween candy. Having that little indulgence here and there makes it difficult to stop cravings. The constant influx of sugar creates a blood sugar roller coaster, triggering an imbalance in your hunger level, energy, mood, cravings, and focus. Try replacing the candy bowl with a fruit bowl – visual cues are powerful! Most of us can probably relate to seeing a commercial for a tempting food… the same holds true for the visual influence of healthy foods. Make them easily accessible and you will eat more of them (or vice versa: out of sight, out of mind for tempting foods). Be mindful of your food choices in social situations. Many of us don’t have the room in our calorie budget for hors d’oeuvres, dinner, and dessert/s, and we most likely would not eat like this at home on a usual day. Treat social eating events like any other day and make choices that fit into your healthy eating plan. Fill up on vegetables, lean proteins, and a small amount of good quality carbohydrates. Eating like this will satisfy your body with an appropriate volume of food and a balance of nutrients, reducing the temptation to overeat. Remember, you can have mashed potatoes any time of the year, so there’s no need to over do it just because it is the holidays. Give yourself permission to indulge in foods that make your holiday season meaningful, but be moderate and mindful of your goals. Make a move. At the heart of it, this season is about time spent with special people. Enjoy this time, but away from the table. After the meal is over, gather in the kitchen to put food away, and then move to another room to play games or maybe go for a walk together. Less time around food equates to less food consumed. Failing to plan is planning to fail. Before attending a holiday party, think about how you want to feel at the end of the night. Remember how you felt last year; maybe how uncomfortable it feels to overindulge and how you don’t want to feel that way this year. Mindset is key here. Is the holiday season five weeks, or is it a handful of days? If we think about the “holidays” being only a handful of days, it can help you to manage the impact the holidays may have on your health goals. Eat moderately throughout the day but don’t skip meals. Skipping breakfast or lunch before a holiday meal can cause your appetite to spiral out of control, making it more likely to overeat when confronted with high-calorie holiday food. Pace yourself. Chew food thoroughly, eat slowly, and put some focus on savoring what you are eating and drinking. Check in with your hunger. Ask yourself, “how does this food taste? What’s my fullness level?”. Bring a healthy dish. This allows you to better control your food choices, plus you might impress your family and friends with a tasty dish that is surprisingly healthy. It is easy to let the busyness of the season take over, and that is when your self-care routine could take a back seat. When stress goes up, sleep tends to go down, and then you may find this is when you reach for quick and convenient foods to keep you going. These foods often lack the essential nutrients you need to maintain your energy levels and to make you feel full and satisfied. They also may not support your immune system and your ability to cope with a busy and sometimes stressful time of year. Plan time for physical activity. Make it part of your schedule. Thinking about the calorie-burning effect of exercise can be self-defeating (for example – two hours of walking for a slice of pecan pie?!). Instead, think about how you feel when you move. Energized, calmer, more resilient to stress. If weight management is a concern, shift your focus from losing weight to avoiding holiday weight gain. Research shows that most people fail to lose holiday weight, which can add to total weight gain over the years. Not many people step on the scale in January and say, “it was totally worth it!”. Rather, we usually find ourselves wishing we had been just a little more mindful. Keep your mind on your goals, and stay focused even though it is the holidays. Keeping these basic principles in mind will help you make healthy decisions, maintain control throughout the season, and feel inspired going into the New Year. Cheers to a healthy, happy holiday season, and a capable and confident start to 2019!